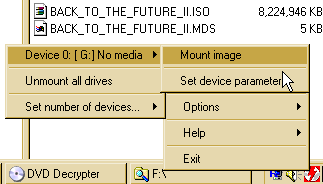 B) Open DVDDecrypter and choose File | Mode | ISO | READ to rip to an .ISO or Press R. If it shows Number of Layers: 1 then you can simply rip to .ISO and burn the .ISO with DVDDecrypter. Most are dual-layered DVDs though. Mount the .iso you just ripped. Right click on daemon tools, choose VIRTUAL CD/DVD-ROM | Device 0: | Mount Image and locate the ripped .iso file. It’ll show as Generic STEALTH DVD. AnyDVD and DVD-Region Free are commercial on-the-fly dvd decryption software which do the same thing but with a few more bells and whistles. Many commercial DVD transcoding software doe not include ripping ability. see a little yellow smiley happy face in your tray icon bar. 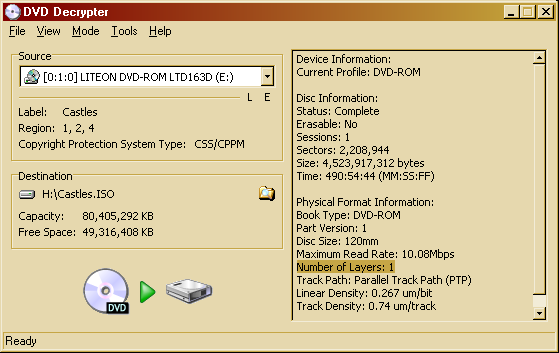 four virtual dvd drives with daemon tools. Once you put an encrypted DVD in a DVD-ROM drive the yellow icon will change colors to green. Now you can start using a commericial DVD transcoding program without having to rip it first to the harddrive thus saving you valuable time. Some don’t like it always starting up at boot time so you can download dvd43startuponoff.zip which contains two registry entries namely dvd43disableonstartup.reg and dvd43enableonstartup.reg. Using PowerDVD to play back my video files I got this screen which means RCE protected. RCE Protection Region set the region to the one you live in. Example: if in USA set to 1. If you ripped / processed directly from DVDFAB or DVDShrink Full-Disk mode you may need to remove RCE protection. Follow the steps 1, 2 and 3. Select your VIDEO_TS Folder and patch via USPS Tracking. You can Ship DVD Decrypter & paste that number into the USPS tracking number .Tracking is possible with DVD Decrypter via US Postal Service (USPS). The DVD Decrypter can be sent through USPS by Entering your USPS Tracking Number. You can start tracking your packages & shipments with USPS Tracking.